Me: Sit down, it's time we talk. Story [looking concerned]: What's going on? I thought....I thought we were happy together. You've been working so hard. Me [avoiding eye contact]: I know, it's just that...our relationship isn't going anywhere. I have no more to give. Story: But we've been together for years! So many drafts! All those scene changes! All those plots you've tried! Me: I know and I've really loved everything you've become, except I think we need to say goodbye. Story [tears welling up in the story's eyes]: No, don't say it. I can't accept this. Story [standing up]: Don't, please. Let me leave with some dignity left. Me: [as the door closes and the story is gone]: Goodbye. 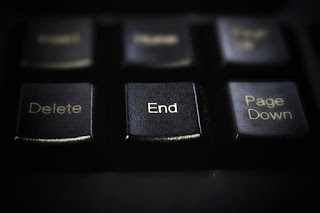 Despite all of our best efforts, sometimes we need to say goodbye to a story. Truly, ruthlessly goodbye. Sometimes it needs to be taken out from the drawer and tossed. Or sometimes, coldly deleted off of the computer. I did this recently and I realized how much I needed to. I didn't want to start 2019 with this story on my shoulders. Despite my own insisting on calling it a "short story," at one point I had a draft that was over 18,000 words (that isn't a short story by the way). I would often go back to the beginning and try again to create a newer and better version. I had changed the setting endlessly. First, it was at a circus. Then a carnival. Then a corn maze. Then back to a carnival. My main character was an adult, then a teenager, and then a middle school kid then some ageless uncertain version of a human that I haven't figured out yet. Despite every attempt, whether it was 2,000 or 18,000 words, each draft had one thing in common - nothing was sticking and nothing about it felt right. When it was time to say goodbye, I hit the delete button on the story drafts. Afterward, I wasn't emotional. I wasn't nostalgic. I knew it was time. Now, several weeks into 2019, and my writing is already better. I feel free. Ideas are rushing forward and I'm even able to recover some old story ideas I never tried out before and have fun with them. I don't know what it is about letting go of a story but sometimes that is the best thing we can do. For me, I thought maybe I could reshape this story that took so many different forms, but I realized what I was trying to do was make a story work that wasn't interesting to me anymore. While the curtain has closed on that story of mine, maybe someone else will pick up the idea somewhere in the universe and they'll make it into something I couldn't. I'd like to think when we say goodbye to an unfinished story, it's because another writer wants to use the idea themselves. When was the last time you said goodbye to a story you couldn't complete? How did you feel afterward? Nicole Pyles is a writer living in the Pacific Northwest. Follow her writing journey on Twitter @BeingTheWriter or visit her writing blog at The World of My Imagination. I held onto it--very briefly--thinking there was something salvageable. A scene. A plot thread. And you're right. When it was finally discarded, it was freeing. It had served its purpose. I didn't learn anything about revising from it, but I did work through some powerful family $hit via the writing of one single dream scene. ... and the writer you are today is perched on the edge of greatness. I enjoyed your article Nicole. I can relate best as a songwriter. I have some half finished songs that I have gone back to again and again but they don't ever gain traction. It's not easy for me to give up on them but when I do, I find it very freeing as you have found. I ditched three novels I wrote back in the early 2000s. They weren't terrible, but I just never finished them. Back then, I didn't have the patience for revision, and I wasn't ready for the commitment and persistence it takes to finish a novel. Then I went through ten years of writer's block while working in the publishing industry and watching other writers crush it publishing novels. Then one day, after taking a creative writing class with Chelsey two years ago, in a ping of clarity, I realized that I would never be a novelist, and it was okay--that just because you don't write books doesn't mean you're not a writer--and it was then I felt like a big weight had lifted from my shoulders. Those novels are still on an old Mac tower that I don't fire up and can't access easily without climbing into the rafters of my garage. I think these steps are leading to Gladwell's 10,000+hours or 10 years of practicing writing to become an expert, and certainly that means closing some curtains. You become a better writer when you can move on from unfinished work and put it behind you. Sioux - I think you are absolutely right! Looking back on that story now that took so many forms, I realized I learned the importance not only telling a story but telling the right one. And not holding onto a story out of pure nostalgia. And like how your fiction story worked out through some of your issues, I think also we tell stories we often need to just get out of our system, even if that's the only purpose it serves. Penny - thank you for stopping by Penny! The hardest thing I learned so far was how easy it was to let go of a story when it was the right time. Angela - I completely see what you mean! The novel writing process is so appealing to me (especially when I visit any tweets with the #WritingCommunity hashtag) but I've come to realize now that telling short stories is just where I'm comfortable right now. I've really begun to accept letting go when needed is an incredible first step! It is hard to let a story go! While I can't say I've let any of my manuscript drafts go yet, we have taken some "breaks." And there are plenty of short stories I've started, even submitted a few places, and then abandoned. I'm learning now that none of these drafts should be considered failures--they are just practice getting us to the place where we need to be, or as in Sioux's story above, providing us with some much-needed therapy! And Angela, while you may not think you are a novelist, you are a writer, as you said! And you never know--that memoir of yours may turn into a hit screenplay one day a la "Wild" or "The Glass Castle!" Nicole, It sounds like you are already off and running on even more projects that you truly happy and fulfilled. Happy Writing! @Renee - you are totally right! Even if a project goes unpublished/abandoned, it doesn't mean that it was a failure because it's all part of exercising that muscle!